Begin your wedding photo shoot at the stunning Newark City Hall, located in the heart of downtown. Have the bridal party pose for a group photo, staggered along the building’s marble front steps. The bride and groom can then pose for a portrait along the balustrade or in front of the elegant entrance doors. On the side of the building that connects city hall to the adjacent police station, there is a small garden area where your wedding photographer can arrange both individual and group photos, using the structure’s stunning Beaux-Arts architecture as a backdrop. Only a few minutes from the city hall building you’ll find the Newark Penn Station, another great photography location! Here the bride and groom can pose for a portrait in the front courtyard, using as a backdrop the station’s exterior, which is covered with stylish floor-to-ceiling windows. Venture inside the station and have your wedding photographer arrange a group photo of the bridal party seated on the wooden benches. The bride and groom can also pose for a private portrait beneath one of hanging chandeliers inside the station. Afterward, make your way to the train platform and have your wedding photographer snap some unique individual and group photos. Once you’ve finished at the train station, take a short limousine ride to Military Park. A nearly triangular 6-acre park in downtown Newark, Military Park has a lush green grassy area that will work perfectly for a group photo of the bridal party. For a fun photo, have your wedding photographer organize a bridesmaids-vs-groomsmen tug-of-war game on the grass! You can also have your wedding photographer snap a couple’s photo of the bride and groom beneath one of the park’s large shade trees or seated on one of the benches. The Newark Museum is the largest of its kind in all of New Jersey, and includes several features that will provide great settings for your wedding photography session. Start off your photography session at the famous Ballantine House, a National Historic Landmark. Built in 1845, the house has belonged to the Newark Museum since 1937 and is frequently open to the public for tours. Have your wedding photographer organize a group photo of the bridal party along the house’s elegant front steps. Afterward, the bride and groom can pose for a romantic portrait beneath the marble arched entrance, in front of the large wooden doors. Finally, have your photographer take some group and individual photos at street level, using the building’s charming Dutch Renaissance architecture as a backdrop. Having finished at the Ballantine House, head over to the museum’s Alice Ransom Dreyfuss Memorial Garden. Here your photographer can take some photos of the bridal party on the verdant grass. The bride and groom can then pose for photos beneath one of the large shade trees. The garden also includes a secluded little brick schoolhouse, a perfectly cozy backdrop for your wedding photos. 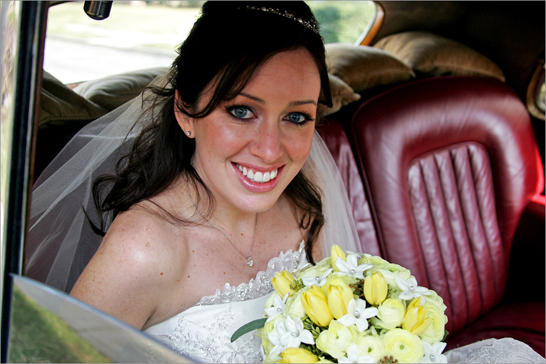 Your wedding photographer can take some seated photos of the bride and groom on the bench in front of the schoolhouse, or an intimate portrait in front of the crimson entrance door, with the brick exterior framing the shot. Adult admission to the museum is $10. Finally, take a short limousine drive over to the Essex County Courthouse. Have your wedding photographer arrange a group photo of the bridesmaids and groomsmen spread out along the front steps of the building. Afterward the bride and groom can pose in front of the entrance doors for a private portrait. Your wedding photographer can also take photos of the bride and groom posing on the red brick courtyard in front of the courthouse, with downtown Newark in the background. Finally, your photographer can use the lush greenery surrounding the courthouse for some group and individual photos. The Cathedral of the Sacred Heart is one of Newark’s proudest landmarks, and a perfect spot to have your wedding day photo shoot. A combination of English/Irish-gothic and French-gothic architectural styles, this magnificent cathedral provides a spacious entrance courtyard on its west side where the bridal party can pose for some breathtaking photos. This entrance includes three separate marble arched entrances that your wedding photographer can use to frame individual photos. From a different angle, your photographer can arrange some photos with the cathedral’s towering twin spires in the background. Almost directly adjacent to the Cathedral of the Sacred Heart is Branch Brook Park, another favorite park for Newark locals and visitors, alike. Here your wedding photographer can snap some candid photos of the bride and groom as they take a leisurely stroll along the park’s winding pathways. Your wedding photographer can also use the backdrop of the cathedral on the eastern side of the park for a portrait of the bride and groom. If you plan on visiting the park during the spring time, you will have the privilege of enjoying the thousands of blooming cherry blossom trees, which will create a truly romantic setting for your wedding photos.